Micro Carbon Residue Tester, 97400-3 | Lazar Scientific, Inc.
An automatic airtight furnace that is pre-programmed to run tests to determine Micro (Conradson) Carbon residue of petroleum products. The digitally controlled furnace has a temperature range of ambient to 500°C. Temperature, flow and pressure values are automatically controlled and values are displayed on the control panel. The test cycle includes an audible ‘end of test’ alarm. A 6 place holder for 16ml sample tubes and a 12 place holder for 2ml or 4ml sample tubes are supplied with the instrument (for sample tubes see Accessories). 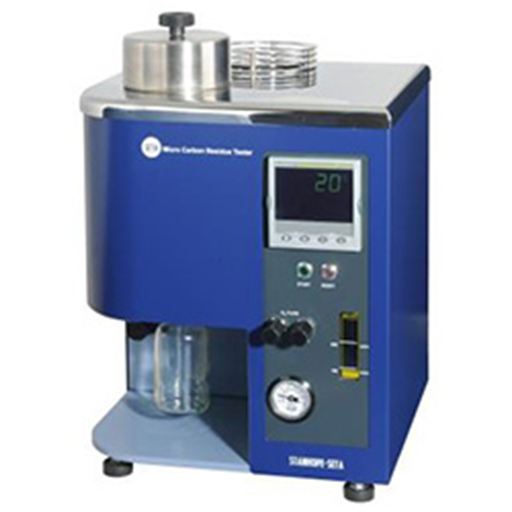 The instrument has an integral condensate trap and exhaust outlet connection that allows fumes to be vented remotely if testing is not carried out under a fume hood. Low pressure and dual over-temperature cut-outs ensure safe operation. Fan assisted air cooling minimises time between tests. Supplied with: 12 place holder, 6 place holder, removal tool, condensate trap, oven lid, braided hose for nitrogen gas (3m), rubber exhaust hose (5m), mains lead and instruction manual.